My husband loves comfort food (who doesn’t?). Because he had a difficult week, I had an excuse to make something in the comfort food category for him. This recipe is from Everyday Food, but I did modify it by adding kohlrabi and turnip greens from my CSA box. I think that the addition of the extra vegetables added a lot to the meal. 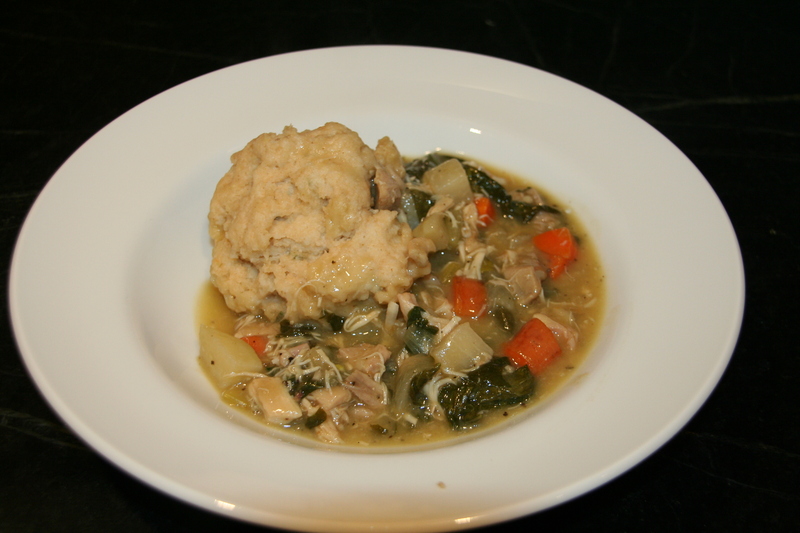 I used rotisserie chicken meat, and I also substituted sage, whole wheat flour and buttermilk in the dumplings. Tasty! In a large saucepan, melt 3 tablespoons butter over medium-high. Add onion, celery, carrots, and kohlrabi (if using) and cook until onion is translucent, about 4 minutes. Add 1/4 cup flour and cook, stirring, 1 minute. Gradually add broth, stirring constantly, then bring to a boil. Reduce heat and simmer 5 minutes. Stir in chicken, green beans, and greens. Season with salt and pepper. Make dumplings: Whisk together 1 cup flour, baking powder, 1 teaspoon coarse salt, and parsley or sage. Cut in 2 tablespoons butter. Stir in milk. Drop heaping spoonfuls batter on top of chicken mixture. Cover and simmer until dumplings are cooked through, about 12 minutes. Serve topped with additional chopped herbs.